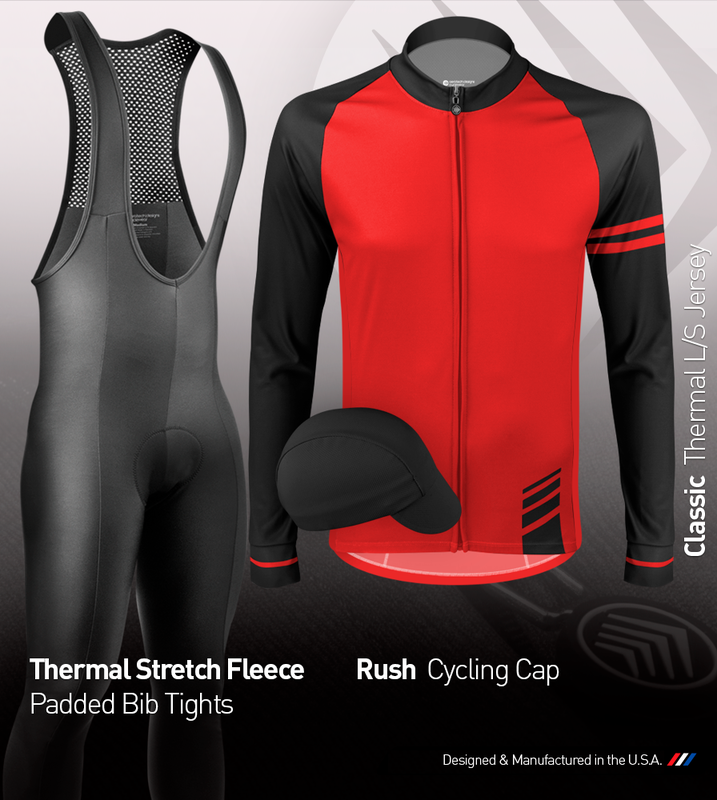 The Aero Tech Designs Peloton Classic Thermal jersey is the perfect winter weight jersey that can be worn alone or with other cold weather cycling gear. It is the perfect addition to any apparel collection because of the classic look and all of the features that are packed into the jersey. The fabric is our AeroHEAT brushed fleece thermal material that is printed in three different color ways, Red and Black, Teal and Gray, and Royal Blue and Gray, for a great look in all conditions. Matching cycling cap available for extra insulation and wicking. The Classic Thermal Jersey comes with a standard full zipper for easy on and off, even with gloves! There are three storage pockets on the back along with a reflective tab for safety and visibility. Each jersey is hand-crafted in our own factory in the United States so we can ensure the upmost quality and consistency in each jersey. 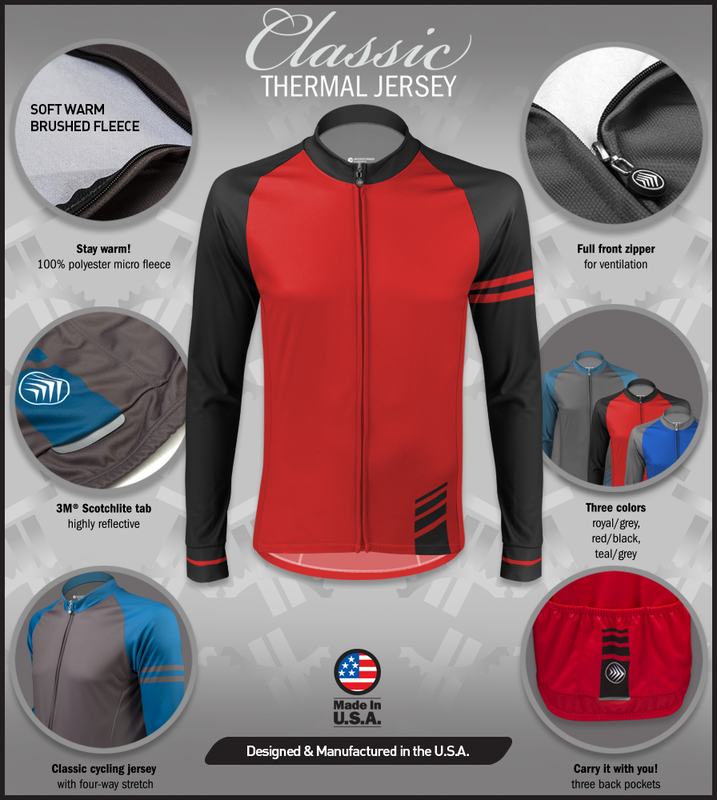 All of our classic thermal jersey are protected by our warranty that unconditionally guarantees against defects in materials and workmanship. Nice long sleeve jersey (my first) think I want another one. Haven't rode in it yet, but it fits well and feel good on the skin. It is a club fit, so you have room for a base layer underneath. As always ATD great apparel. Just received it last night so I haven't been out on a ride in it yet, but it's so gorgeous. Beautiful, high-quality fabric and colors (grey/teal). I typically wear 3X ATD jerseys and this 3X is a perfect fit. I needed something for temps in the upper 40s and low 50s and I think this jersey over my base layer will be fine. Hope to post back after a ride.